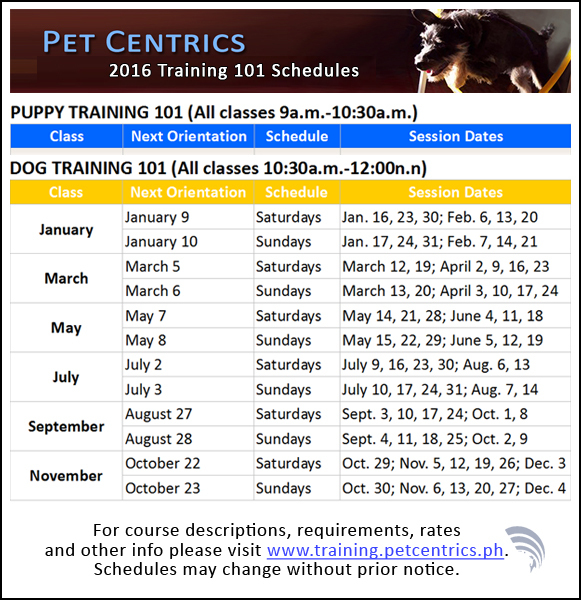 I’m happy to announce that the schedule of classes for Puppy Training 101 and Dog Training 101 in 2016 is now available for viewing HERE so you can already plan your activities with your dog. In other news: All Pet Centrics Dog Training related material is being transferred to the new student portal at www.training.petcentrics.ph. The site is still under construction and there are a few bugs and broken links still left to clean up before the New Year. But you can already explore some of the free content including info about the Training 101 courses. Know of someone else who might like to join Pet Centrics Dog Training Classes? Click on the image below, right-click and download to share. Also of note, opening of registration for the January 2016 Class will be on December 5. 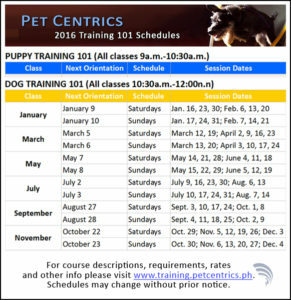 If you would like to receive updates or notifications for registration opening – for this class or other classes coming up later in 2016 then do subscribe to the Dog Training 101 Notifications List. I hope you and your dog are enjoying the holiday season so far. We’d like to inquire about rates for puppytraining classes. Please click HERE for detailed information (course description, rates, enrollment procedure, etc.) regarding the Training 101 course.